uCart is a free application for playout of jingles, sound-effects and other audio in a radio broadcast environment. It mimics a traditional NAB cart machine but without the wow/flutter and re-cue time! Loading a slot can be done by dragging a file from Windows’ Explorer or the built-in File Browser. Slots can be ejected after playback if desired. Sequencing of slots is also possible – Enabling you to fire up to 6 carts in sequence with just 1 click. Remote-start via joystick is also supported. Joystick remote-start via analogue 15-way port or USB interface. Buttons 1-6 start the players. 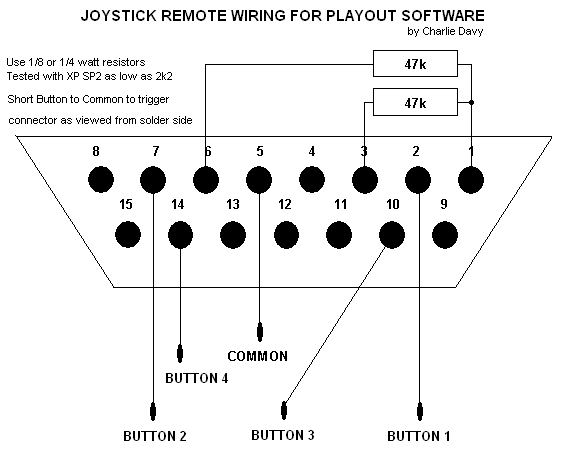 See this image for a 4-button wiring example. 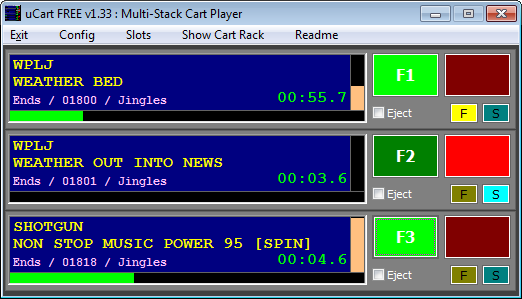 A File Browser with 8 preset “Cart Racks” allows you to easily move between your favourite folders of audio/jingles. When loading WAV files, the CartChunk information is read (Artist/Title, CutID, Outcue, Start+End Date, Category) and MP3 files have their ID3v2 tags (Artist/Title, Year, Genre) read. The duration of the file is also shown.